CEO Dr Julian Elder and General Manager Māori Forestry Futures Hēmi Rolleston. Scion has a new General Manager Māori Forestry Futures in Hēmi Rolleston (Ngāti Whakaue, Ngāi Te Rangi, Ngāti Ranginui) as of late February. Hēmi’s experience in the primary industries as CEO of Māori kiwifruit business Te Awanui Huka Pak and the research and development sector as General Manager Māori Economy and General Manager Sectors at Callaghan Innovation makes him an ideal fit for Scion’s own primary industry based research and development. Scion Connections met with Hēmi to kōrero about what brought him to Scion and back to Rotorua. What attracted you to the role at Scion? 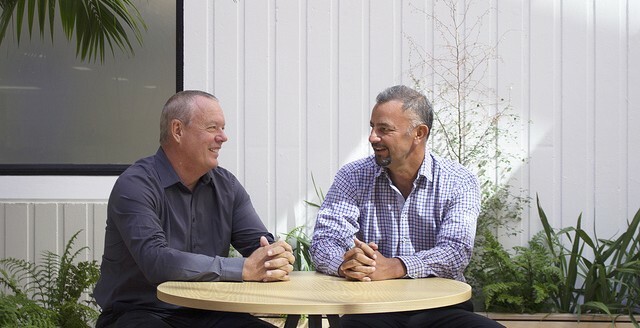 I am really passionate about making a positive difference for Māori by using my skills, connections and experience in the Māori economic and innovation space. Scion’s work is in an exciting area of innovation, in a field that is also special to Māori. Māori are becoming a significant economic entity and forestry is one of our key resources. Our people are no longer satisfied being a landlord. We want to innovate through research and development. I see Scion playing a significant role in partnering with Māori to achieve their aspirations, through Scion’s capability and experience in forestry science and innovation. Alongside that is a great opportunity to take advantage of the focus on government priorities around forestry and sustainability. Collectively, Māori and Scion can partner to make an exciting difference for Aotearoa and the world. Where do you think is Scion’s biggest area for potential growth? The biggest potential is through creating collaborations with Māori looking at innovative opportunities throughout the value chain. There is also potential to identify land use options for Māori in forestry and ensure that returns are maximised through use of innovation while balancing Māori values. Bringing the Māori world view into mainstream thinking and weaving in the Māori story will provide a unique point of difference. We also need to take the tamariki of today on the journey, and equip them with the skills and knowledge to provide an exciting future using this resource. What do you think the biggest challenges will be? The biggest challenge is in changing the mindset and attitude from both Māori and in Scion. It begins with developing authentic relationships and the rest will follow with each party understanding the respective values and opportunities they can bring to the table. This is where the magic happens, there is so much opportunity in this space. Another key challenge will be to prioritise workstreams. We can’t do everything, we need to focus on the areas that will make the biggest difference and that will help to show the way. First, we must get everyone on the waka before we paddle off.